As of October 20, Saudi authorities have offered no updates or changes, taking some chances to disute larger numbers emerging and reiterate the 769 tally (see next entries below) but otherwise seeming paralyzed as the rest of the world arrives at tallies several times the admitted size. An early Press TV report when only 125 Iranians were known as included, "The head of Iran’s Hajj and Pilgrimage Organization says at least 1,300 people have been killed." Ohadi "added that the overall death toll is expected to exceed 1,500." 2,000 looks poorly supported, but the source and reliability of their smaller 1,200-1,500 death toll range is unclear. We can see above the numbers from Saudi official and their ID photos creeping up quite close to the numbers Iran was offering at the start, but officially the kingdom seems locked into the numbers from the 26th. I am speaking on behalf of a great nation who is mourning the loss of thousands of Muslim pilgrims and hundreds of its citizens. Old, young, men and women who had come together in the grand and global spiritual gathering of the Hajj, but unfortunately fell victim to the incompetence and mismanagement of those in charge. Due to their unaccountability, even the missing cannot be identified and the expeditious return of the bodies of the deceased to their mourning families has been prevented. The scope of a calamity in which thousands of innocent people from the four comers of the world have been killed and wounded is so broad that it cannot be dealt with as a natural disaster or a local issue. The pain and emotional distress inflicted on millions of Muslims is greater than what can be repaired merely through material calculations. Public opinion demands that Saudi Arabian officials promptly fulfill their international obligations and grant immediate consular access for the expeditious identification and return of the cherished bodies. Moreover, it is necessary that the conditions are prepared for an independent and precise investigation into the causes of this disaster and ways of preventing its repetition in the future. Every other credible source gradually came to agree the disaster was much bigger than the Saudis acknowledged, with a death toll probably at least twice the size, and easily the deadliest such disaster to hit the Hajj in its entire history. AFP: 1,633+ by combined death tolls: Similarly, AFP had a tally by October 1 of 995 dead, by adding death tolls "from 24 countries, mostly from official sources," and including 464 from Iran "Another 636 are reported as missing," the report adds. This was eventually updated by October 14 to "at least 1,633, according to tallies given by foreign officials, making it the deadliest incident in the pilgrimage's history. Wikipedia: 2,226+ by combined death tolls The Wikipedia article 2015 Mina stampede has a table showing nationalities of victims currently totaling 42 nation (to AP and AFP's 16-24). As of October 20, this fairly well updated collation shows: 2,226 dead, 98 injured, 680 missing. This is likely to be off in a couple of ways but likely not by much. It shows a death toll in excess of 2,900 is likely. All these counts exclude Saudi citizens or others with no nation reporting for them. 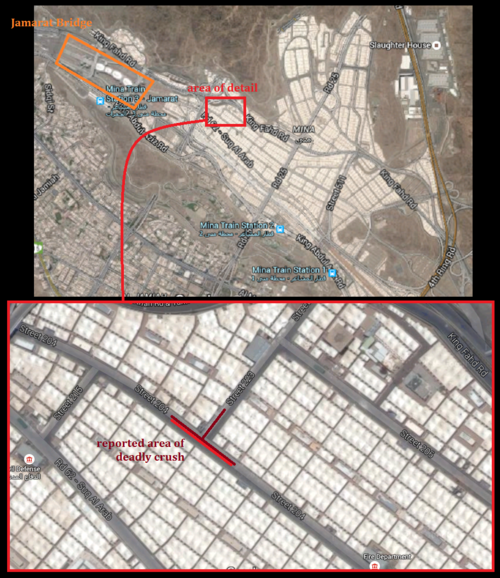 Middle East Eye: 2,432+ by numbering system A Saudi source who spent four days in Mina covertly taking photos of the displayed dead people at several places found that the used numbering system suggests that more than 2,000 people died. At least early on, Saudi authorities were nor providing nationality breakdowns for the victims.One report cites "Saudi Arabia's civil defense directorate" with an early count of 310 dead "The directorate says the victims in Thursday's stampede are of different nationalities, without providing details." On September 27, Inquisitr reported "officials have yet to declare the nationalities of those killed or injured." But some nations issued their own reports on numbers dead, wounded, or missing. Iran is believed to easily top the list with at least 464 killed as of October 1,  quickly raised to 465, with no further update by October 9. Egypt was hard-hit, with 54 confirmed dead, at least 26 injured, and 120 still missing on the 28th. By the 29th they were reporting 78 killed. (citation needed) Later, it was 124,  then 146 on October 5, with 92 still missing. October 20: 182 dead. Later, 190 dead, 45 unaccounted for  - likely 235 dead. Indonesia: at least 34 Indonesians were killed, of a total 112 missing. Later it was raised to 46. (citation needed) By October 6, the number had risen to 100 and then to 103 Indonesians killed. Wikipedia's article has a good list of casualties by nation - 41 nations report at least 1 citizen dead, 2 others have some injured and/or missing. Saudi Arabia: Saudi officials neither confirm nor explicitly deny if any citizens of the kingdom were among those who died, were injured, or just went missing. There don't seem to be any reports available, anyway, about such a statement, and the detailed Wikipedia table cited above of 43 nations doesn't even have a line for the nation that hosted the tragedy. The Saudi civil defense directorate says that as of late Thursday, the death toll from the horrific crush during the hajj pilgrimage stood at 719, but that the figure probably would rise as bodies continued to be counted and sent to the morgue. In Iran, state television raised the death toll from among Iranian pilgrims, saying 131 were killed in the crush on the outskirts of Mecca. Amateur video has appeared online, apparently showing the moment when a deadly crush began in Saudi Arabia’s Mina as two streams of pilgrims were redirected through a single gate. Iran’s Hajj and Pilgrimage Organization puts the death toll at more than 1,300. The incident happened in the tent city of Mina, east of Mecca and the grand mosque, as pilgrims moved towards the Jamarat bridge structure for the ritual of "stoning the devil." The crush reportedly happened at the intersection of "streets" 204 and 223, here on Gogle maps and shown in a graphic by Anadolu Agency, about one kilometer southeast of the Jamarat structure. The basic area is also shown at right, with hopefully a more detailed mapping later. ABC.net report cites a Sudanese pilgrim in Mina who "said this year's Hajj was the most poorly organised of four he had attended." "People were already dehydrated and fainting" before the stampede, said the man, who declined to be named. People "were tripping all over each other", he said, adding that a Saudi companion had warned him that "something was going to happen". TEHRAN (FNA)- G. Keith Still, professor of crowd science at Manchester Metropolitan University who has worked with the Saudi authorities to design the Jamarat Bridge that leads to the pillars, revealed that he had many times warned the Saudi officials that route 204, where the Thursday stampede happened, shouldn’t be overcrowded. Crowd-control experts believe victims in the crowd were more likely to have died of compressive suffocation, rather than a "stampede." Abdullah Lotfy of Egypt told the Associated Press, "People were climbing over one another just to breathe... It was like a wave. You go forward and suddenly you go back." Alleged survivors interviewed by PressTV blamed the high number of deaths in part on the poor rescue efforts where some wounded were left to die without help for "four or five hours". They also alleged that the rescue workers asked for nationality and discriminated against Iranians, and that large numbers of Saudi soldiers stood idly by without helping the dying. An upsetting amateur video from the scene shows people jammed together, struggling to get free. After the survivors were removed, the bottom layer of dead were left, as seen in news photos. ABC.net reports King Salman has ordered "a revision of the plans" for Hajj organisation so that pilgrims can "carry out their rituals in complete safety", the official Saudi Press Agency said. There's no explanation offered yet how God managed to confine so many people in one fenced and policed area in 46-degree weather and then let them out only though one narrow gate. Others sympathetic to the royals find human error involved, but only on the part of the pilgrims. Other sources are more specific about the culture(s) in question. On the day of the incident, it was reported that al-Arabiya (Saudi royal family owned) had aired a statement by the head of Central Hajj Committee Prince Khaled al-Faisal has blamed the stampede on "some pilgrims from African nationalities." KSA denies this was ever said (see bottom of this report). Indeed, the original statement is hard, or impossible, to find. One video of September 24 that mentions "African nationalities" has a reporter saying, with rough translation below. "Direction contrary to the traffic and prevent Pilgrims, and from different nationalities, especially Africans who had come from security. That the tendency to reverse course and enter On the pilgrims, who are here as well. Another problem is a problem. Other." Prince Khaled isn't even named in that. Another Sept. 24 video that came up in the same search mentions the prince and also almost says this: "The holy city of mecca area Chairman of the central Hajj committee, Prince Khaled Al-faisal, Ashraf On the ground on the efforts to deal with. ... (later) That the camps Nationalities in the camps African relations are a majority." The supposed statement was widely criticized (see here and here, for example). This concept has been expanded into an article at Monitor on Massacre Marketing (ACLOS-affiliated blog): Mina Hajj Tragedy: Saudi Arabia Blames Iran. Combined sources explain Iranian pilgrims first allegedly headed straight to the Jaramat bridge from elsewhere, rather than going to their tents first as ordered. Then they left the bridge early and went back to their tents at the wrong time, running into the next group. As mentioned there, Al-Arabiya produced a computer animation of the allegations. This shows the collision on street 204 south of the intersection with street 223 it actually happened at (see graphic above). 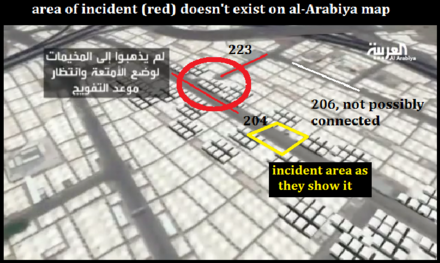 In fact, the animation shows there is no place where 204 and 223 meet, with an imaginary row of tents blocking the connection. This prevents any possibility of the blocking of street 206 (which connects to 223) being relevant to what happened, and leaves the blame on the unruly Iranians. "Those who sit in their homes tweeting and repeating things they do not know should not indulge themselves in such issues. There are officials and authorized persons who investigate the accident and make reports, and they did not even comment on what the public tweets on social media." And Dr. Mohammad Al-Sahli, deputy dean of the College of Islamic Shariah at Umm Al-Qura - and furthermore a member of the Human Rights Commission of Saudi Arabia - agreed. He's paraphrased as saying: "there are people who are trolling in muddy waters, exploiting the accident to defame the image of the Kingdom in the media to blur the great achievements of the country." A Fars News English report includes a list of prior incidents back to the 1970s, many at this same bridge used in the "stoning the devil" ritual that turned deadly this year. This page was last edited on 12 November 2015, at 07:38.